In today’s world it’s finally becoming common for all businesses and organizations to have a Facebook page. Most of them will also have a Twitter account and go as far as even creating a Google Plus account too. It’s taken quite a while to sink in that these popular social networking sites are an important part of their brand’s presence. What about text? Where does that fall in? Well over the past few years, business who have been using text marketing on a regular basis have seen pretty exciting results from this marketing stream. Still with how great of a tool it is, it hasn’t even come close to critical mass. It’s still in its infancy stages for small businesses the same way many popular social media streams were just a few years ago. 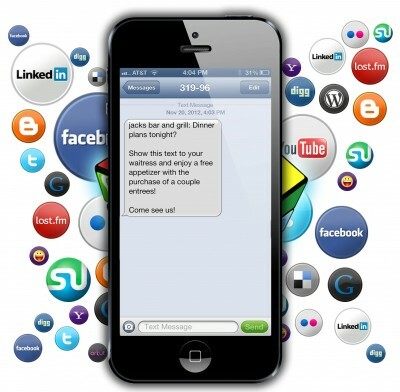 Small businesses are starting to catch on, however, that text marketing is a must have tool in their advertising quiver. When they compare the direct return they receive from text and social media, it even furthers that notion. So why is text marketing so much more powerful than social media? Text marketing has a much great reach. They say that only about 10% of Facebook users will see something that a business they follow posts. That makes total sense if you think about it. The more friends you have on Facebook, the less likely you’ll be to see that post as your feed’s priority is centered around your friends first. Text marketing read rates are around 97% which is incredibly powerful! It more targeted than social media. Think about how many times you’ve seen a business that you’ve been to before on Facebook. You don’t really care much about them and don’t know when you’ll be back but because you had a decent experience there, you click the “Like” button. We all do it. Then we go back and spend time with the ever so popular “Facebook Cleaning” where you unsubscribe from and delete friends that you don’t care to read about anymore. Because text is so much more personal, the only people that will join your text marketing list are people who really care about what your business offers and has to say. Noting gets the word out faster. If you need to cancel an event or release an important time update, 95% of texts are read within the first 5 minutes. Facebook doesn’t come close to being that timely. This also allows you to reach people EXACTLY when you need to the most. Like on days when business is slow and you need to pick up some extra traffic.